» Eco wrapping ideas with real WOW Factor! Eco wrapping ideas with real WOW Factor! Yes, your presents can be awesomely wrapped AND enviromentally friendly. Here are 14 ideas to set your creativity on fire. Ever wondered where the tradition of wrapping presents came from? Well, the Japanese have been been wrapping with furoshiki – the reusable wrapping cloth still in use today – since the Edo period while in the west, the upper class Victorians would use elaborately decorated paper, ribbons and lace to conceal gifts at Christmas. But it wasn’t until 1917 when a pair of brothers running a stationery store in Kansas City ran out of their standard inventory of tissue paper found among their supplies a stack of French paper meant for lining envelopes. They priced it at 10c a sheet and it quickly sold out. In fact, it was so wildly popular, that by 1919 the pair began producing and selling their own printed paper designed for wrapping gifts, and an industry was born. We send an extraordinary amount of paper to landfill each Christmas, but beautifully wrapped gifts don’t have to be a wasteful affair. Use recycled butcher’s paper as your starting point, and start saving wrapping paper, ribbons and gift cards from this year to use next Christmas. Many boxes are reusable and with a bit of imagination can be used in any number of ways, as can recycled paper such as newspaper and music scores. From toilet rolls, to cereal boxes to biodegradable gift tags, here are some simple yet effective crafty ideas that celebrate this centuries old tradition with real wow factor. 1. From roll to wrap! Don’t throw out toilet rolls, re-invent them into beautiful little gift boxes with this clever folding technique. A beautifully wrapped present doesn’t have to be complicated. Bring the outside in with a sprig of rosemary or lavender. Layer recycled butchers paper over tissue, then cut out a pattern with your stanley knife for a 3D effect. Biodegradable wooden spoons make perfect gift tags. Make that plain butcher’s paper sing with the end of a pencil and white paint. Want to forgo sticky tape and disposable paper all together? Do like the ancient Japanese and embrace the ancient art of furoshiki with a tea towel or scarf. 7. Start saving your newspapers now! With a few festive touches it will make a welcome addition under your tree. A beautiful little gift box anyone will want to keep – and kids will still play with long after the present has been forgotten. Best of all, you can make it any size you want. Recycled music paper makes such pretty wrapping paper! Head to yur local op shop and hunt for music scores. 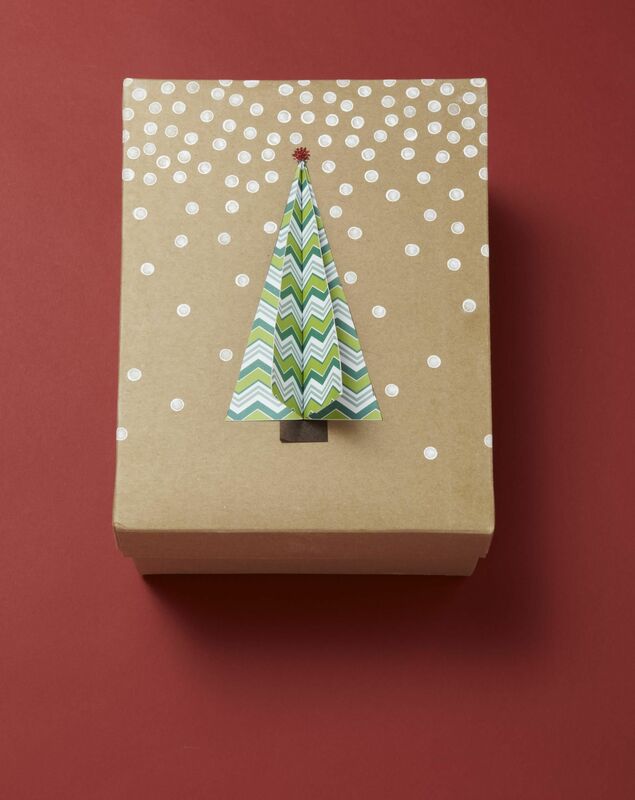 Reuse an old box by wrapping in recycled butcher’s paper and embellishing with this pretty 3D Christmas tree. Eco wrapping doesn't have to be understated. Do like the Victorians and embellish your gifts with reusable lace. Need a box to wrap your present? Just upcycle an old cereal box in under a minute! Is there anything that they DON’T make look beautiful? A lint roller, some rubber stickers, paint and a fun afternoon of rolling equals some beautiful wrapping paper. Have you got any ideas for DIY wrapping paper? We'd love to hear about it! Join the conversation below.